Throughout the course of both my recovery from surgery as well as my chemotherapy, I have been moved by the lengths that everyone involved with this blog have gone to show their type of support. I have written that I realize everyone has their own coping strategies and methods of showing support for my situation. I don’t pretend to judge any of them as everyone has different emotional backgrounds and will ultimately need to deal with my cancer in their own personal ways. One person’s coping mechanism is not for everyone. For me, it’s enough knowing that I have a support system generated by my own circle of friends and family and through this blog which has given me the encouragement to push through difficult times. I will mention again how much I appreciate all the different methods (thoughts, prayers, prayer groups, gifts, visits; the list goes on!) that readers and posters have introduced me to. It’s been extremely enlightening and helpful. In light of all the support, I must highlight a recent one that touched me closely because of it’s association with running. Many of you know I was (and will be again!) a runner. I ran 3 marathons in my life, and a dozen or so half marathons with a number of shorter distance races interspersed. I have run most of my adult life and have missed it tremendously during this latest hiatus. Many of you may have read on the blog a few responses from Dan Sullivan or Mike Pfister. These two gentlemen, for the past few months, have been recruiting a group of runners from my previous assignment, the Defense Threat Reduction Agency, just outside of Ft. Belvoir, VA. I worked with most of them for four years and while there established friendships that have and will last lifetimes. 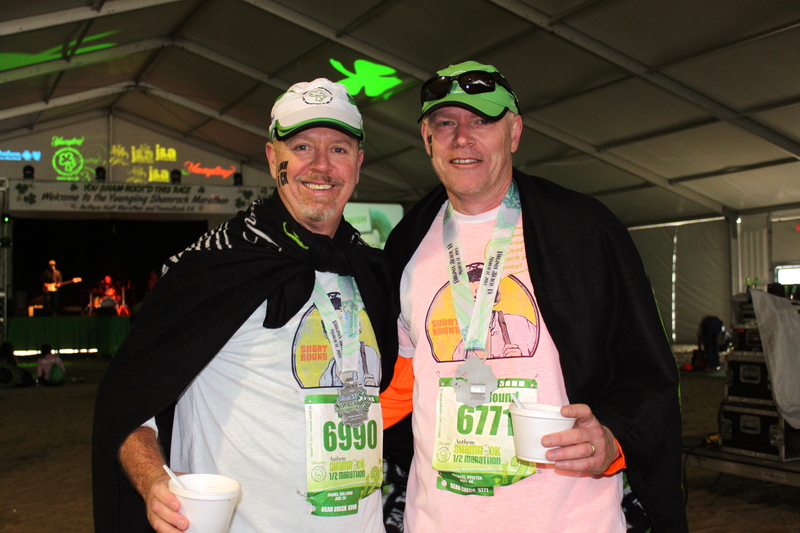 Just after Christmas, Dan sent me a message on the blog that said he was going to run the Shamrock Half Marathon (St. Patrick’s Day in Virginia Beach) in my honor. As the months progressed, just Dan became Dan and Mike and eventually both assembled a group of runners and non-runners to run different parts of the race for me. 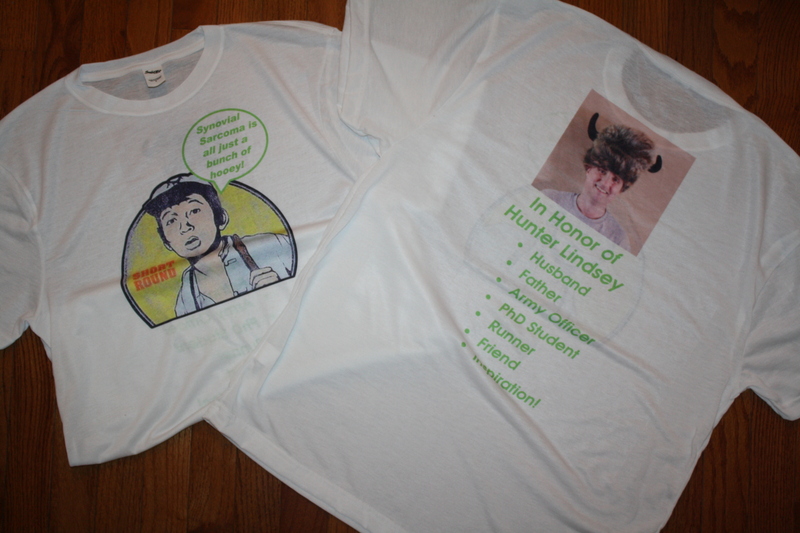 They designed a Short Round – based race T-shirt they would wear to increase awareness of my situation – Short Round comments that “Synovial Sarcoma is all just a bunch of hooey!” They made a banner to advertise some of my character traits. 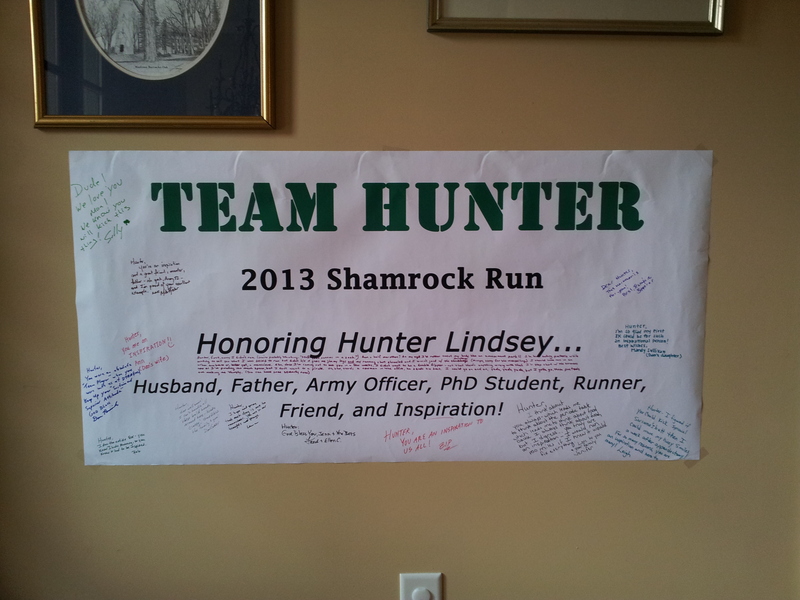 The banner went to the race, back to DTRA for inclusion of more folks’ signatures, then was mailed to me. It now hangs in my hallway. Some would run the whole marathon, some the half and some the 8K. Regardless of the distance, I was incredibly humbled and thankful. The races took place on my latest post chemo weekend, when I was rather low on both emotions and energy. On that Sunday, I received emails with pics of the runners obviously having a great time in their shirts both pre and post race. They were toasting me even though they had just finished grueling distances. Some had even shaved their heads for me (thanks Sully, Mike and Zip!) I was inspired and uplifted and coincidentally, at the exact time I needed it! Some of the pics are posted below. These folks literally went extra miles for me and I thank them from the bottom of my heart. They are some of the best folks that I have had the privilege of working with in my career. 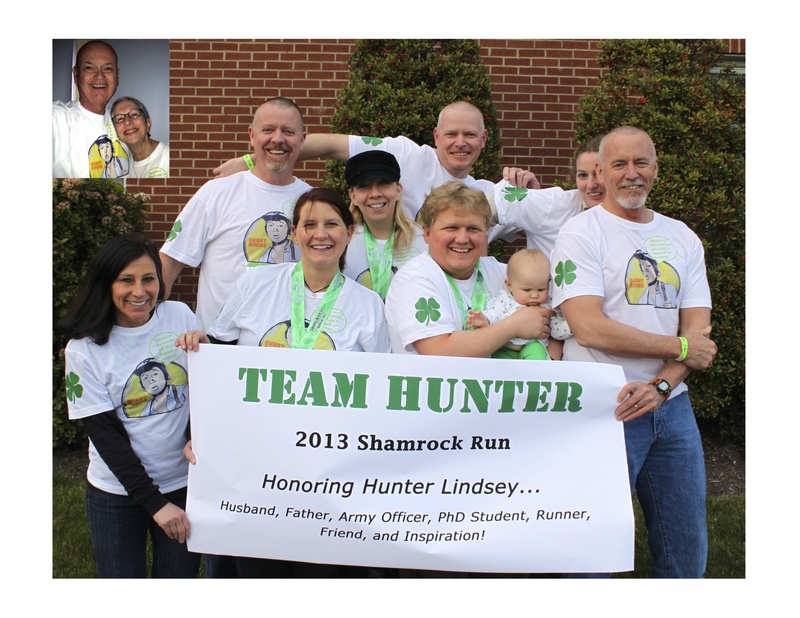 I am inspired by their selflessness and once I am back to running, I want to emulate them and look forward to joining similar teams in the future to honor other runners who have been forced to give up something they love for whatever reason. The signed banner now hangs in our hallway! Medically, I am feeling upbeat this week, which is the norm for this time. This week I actually drove my car, by myself, without Jenn chauffeuring me!! That is another milestone that gave me a sense of unimaginable freedom! I haven’t driven since October. I have another chemo week starting next Tuesday, which will bring me down again a few notches, but since it’s working the prospect of a few days of lethargy and physical discomfort are palatable. On the prosthetic front, my days consist of practicing walking in a new socket I received last week, which is less painful than the first. But my prosthetist still wants to improve the socket and is working on yet another one that will fit more securely. I’ll get that one on Friday and continue progress with the leg. Going through a number of sockets is typical for new amputees, so I’m not worried. I have an in-home physical therapist who has been working with me since the amputation to strengthen my body in anticipation of walking again. She’s been terrific. Luckily for me, she is tough and pushes me on days when I’m complaining like a little spoiled brat. I’m still using crutches with the ultimate goal of putting full body weight on my prosthetic. Some days are better than others! Just like life in general. Thanks for all the support and continued reading! Good news on the tumor front. They are still responding to treatment so more chemo! Whoo hoo…:-\. We are really happy with the news. Really. Happy. And I should clarify, that these are lung tumors that my oncologist is measuring and we are able to see tumor shrinkage compared to previous scans and we also see tumor necrosis, which is where the tumor dies from the inside out. It’s pretty cool, actually. I started another 3 day round today and will get another in 3 weeks then more scans around the end of April. At that point, pretty much the same deal as before. More tumor shrinkage, more chemo; as much as I can tolerate. Sorry for the short one tonight, but I’m tired after the first day and this week will be more tiring. Anyway, scans are read and I’m off to bed! Have a good night! First of all, let me express my gratitude for the responses to the last blog post. As always, they are amusing and reassuring. We rely on the support displayed by such posts. Thank you again. I’ve had the leg just over a week now and it has been interesting to say the least. I’ve been able to progress to wearing it for 4 hours during the day, and walking inside (still crutch assisted) with it for 30 minutes to an hour. I’m somewhat surprised at the rate at which Short Round is getting used to the new attachment. The hardest part of having the prosthetic is putting weight on it. I have to eventually get to the point where I can put full weight on it. I had another appointment on Tuesday and it’s already time for a new socket. My residual limb has increased in mass since the first casting a few weeks ago and the current socket is too small in diameter. So the prosthetist took another casting and I’ll be getting the new socket within two weeks. I still can use the current socket; it’s just not as comfortable – kind of like a pair of shoes that are too small, but are still too awesome to throw out. With regard to my tumors, we are in a holding pattern until we get more information. I have a CT scan scheduled for Monday too look at my lungs. My oncologist will go over it with us on Tuesday and we’ll decide then whether to continue with chemo. If so, we’ll start another round on Tuesday. If the scan shows the tumors are continuing to respond to the treatment and are still shrinking, we’ll go on with chemo. If the tumors have stopped responding, then we won’t do the treatment. As much as I dread it, we are keeping our fingers crossed for continued tumor response…grrrr. I’ll be honest though, this chemotherapy thing is not a whole lot of fun like I was told. I’ll keep this one short. I have to get back to walking laps round the house. Thanks again everyone for the support. Have a great weekend and I’ll post with the results we get on Tuesday.